The Men of 'Moonlight' Already Have New Roles: Calvin Klein Underwear Models! The men of Moonlight are winning! See the Best Oscars 2017 Red Carpet Looks Here! From Oscar winners to… underwear models? Hot off a night of big wins—the cast of Moonlight took home Best Picture after a dramatic mistake on stage and Mahershala Ali was awarded the Best Supporting Actor Oscar—the leading lads have just scored a big campaign with Calvin Klein, just announced on the brand’s Instagram and website. Trevante Rhodes, 27, Ashton Sanders, 21, and Alex R.Hibbert, 12, each played the lead character Chiron in different stages of his life, and star in the ads along with Ali. 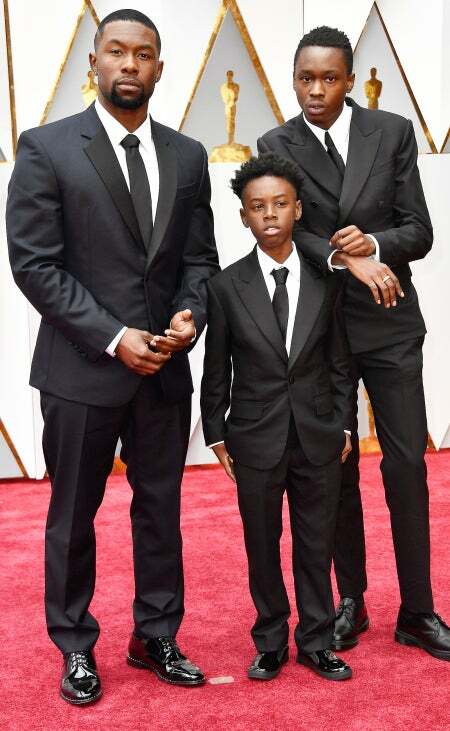 The three actors wore Calvin Klein suits to the Oscars, as did nominated costar Naomie Harris. This series of nine photos, shot by Willy Vandeperre, marks the second major campaign (the first starred Millie Bobby Brown) for designer Raf Simons, the brand’s new creative director, who started in August. He debuted his first collection with the brand during men’s fashion week in January and launched his first full collection (which included both men’s and women’s looks) with a star-studded show during New York Fashion Week in February. Calvin Klein has long featured celebrities in its underwear ads—Justin Bieber, Kendall Jenner, Zoë Kravitz and more have rocked the brand’s signature skivvies—but featuring the cast from a feature film is unprecedented. To see all the photos, click here.